"I think it's going to be a little trickier figuring out some of the freezing weather … but there are already a lot of large companies operating in those markets," she says. "It's just a matter of packaging it and turning it into a franchise." Since finishing university, Paul Monger has worked in the franchise business — as a franchisee and on the franchisor side in development with several well-established brands in the past 15 years. Then in 2008, he decided to take what was essentially a fledgling, modern-day butcher shop and compete head-to-head with the dominant market heavyweight, M&M Meat Shops. In 2008, he bought up Clancy's Meat Co., a British-Columbia based seven-location "very loosely franchised" business, and spent 2009 building the behind-the-scenes systems and processes needed to launch it as a national brand. M&M Meat Shops, the big player in this space has about 450 locations across Canada. "When the customer comes in, the look and feel is very much like a modern-day butcher," says Mr. Monger, chief executive of Clancy's. "The modern-day butcher shop is one of the things we're hitting on, but much like M&M Meats we serve so much more." Clancy's used to offer primarily fresh meats, cut on site, but had too much wastage and spoilage. Mr. Monger retooled the brand, reducing — but retaining — the fresh meat component and adding a larger, self-serve frozen section, along with several "value-add" products such as specialty pastas, sauces, rice dishes and other items not widely available. Most of the meat preparation has been centralized at a local and national distribution network, so owner-operators are no longer cutting meats behind the counter. Instead, they focus on product knowledge and some minimal in-house preparation. "It was a year to take that brand … and mould it into something we could take across the country," he says, adding the expansion plan calls for 100 stores within five years. "We don't want to grow beyond our capacity to support our franchisees." The trick to taking on a dominant brand such as M&M is to take a niche concept and replicate it into a franchise model. Clancy's plans to locate in neighbourhood strip malls and plazas just as M&M does. The differentiator is in the product mix — fresh meat combined with self-serve frozen products and value-added products. Mr. Monger also has to keep up with brand tweaks, such as M&M's introduction three years ago of the "uptown" concept launched in downtown Toronto. M&M founder MacVoisin describes the company as having "built a fantastic reputation in residential neighbourhoods and suburbs from coast to coast" and the uptown or urban professionals concept "was created so busy people can enjoy restaurant-quality food without hours of preparation." 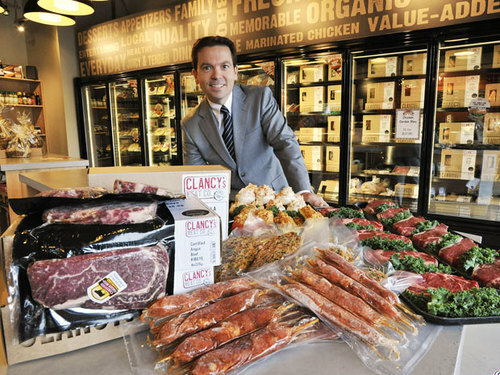 Clancy's plans to go one better, focusing on higher-end meat cuts not available in typical anchor grocery stores or its direct competitor, using a self-serve model to retain the original market feel. Standing out in a crowded franchise space is something Tressa Wood knows well. The former vice-president of operations for 1-800-GOTJUNK who was credited with helping propel the company from 40 franchises with $15-million in revenue to a peak of $130-million with franchise locations in three countries, now runs Men in Kilts, a Vancouver-based window-cleaning, power-washing and gutter-cleaning business. Yes, the men doing the work actually wear kilts — their catch phrase is "no peeking." "It makes people smile for what is really a mundane service," says Ms. Wood, chief executive of Men in Kilts. "Having a unique brand is hard to do these days because there's so much competition." Unlike Clancy's, there is no well-established, national franchise brand. Competitors exist, but they are mainly local businesses. Ms. Wood plans to use the generic name of the brand to add multiple revenue streams as necessary as the company rolls out its expansion in the year ahead. Plans are to open five or six locations in 2011 in Calgary and Toronto, and south of the border in Seattle, Portland and San Francisco. It might be Men in Kilts wearing long johns through the Canadian winters, but she's confident the brand can be adjusted to whatever conditions exist in each market. The model could include snow removal, painting and other services, since the name doesn't limit it to one revenue stream. For both Clancy's and Men in Kilts, the success of their expansion plans will come down to their ability to differentiate their brands in crowded markets and replicate the success of a few locations into national, or international brands born out of niche concepts. "It's really hard to stand out, so it's important to have something that does stand out, but you need more than that," Ms. Wood says. Clancy's, meanwhile, has sold 25 franchise locations and will begin opening stores across Canada in January. "We're on the cusp," Mr. Monger says.